Sir Edward Leithen, barrister and MP, is hunting with his friends in Scotland. After a few drinks, the men folk start trading stories of all the adventures they've had in exotic locales like Spain, Greece, and Jamaica. Then Sir Edward's like, "You guys are so lucky, I never get to go anywhere or do anything. Oh, right, except for that one time I SINGLE-HANDEDLY BROUGHT DOWN A CABAL ORGANIZATION OF ANARCHISTS INTENT ON THE DESTRUCTION OF WESTERN CIVILIZATION." 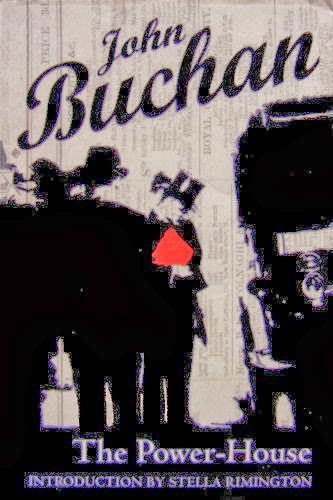 I enjoyed The 39 Steps, John Buchan's most well-known novel, and have been planning to dig into more of Buchan's work for awhile now (awesome random thing that has nothing to do with this review: When I first read The 39 Steps I tweeted about how much I liked it, and Buchan's great-grandson tweeted me back out of the blue to say thank you! That's one of the cooler things that's happened to me on Twitter). The problem was I didn't know where to start. Then I ran across The Power House, the first in the Leithen series, on Librivox and decided to give it a try. It wasn't as gripping a read as The 39 Steps, but it was fun. Sir Edward Leithen is a very different character from Richard Hannay, the hero of The 39 Steps. In fact, it would be fair to say he's almost the polar opposite. Hannay is a dashing, witty rogue and outsider, while Leithen is a steady, conventional member of the British gentry whose life is an unvarying carousel of "flat, chambers, club, flat." Leithen's life would probably make Hannay want to blow his brains out, but Leithen is 100% down with the drudgery. That actually makes sense in the context of the novel, because Leithen represents civilization, with all its boring steadiness and routine. So who better to defend civilization against the Power House and its ominously polite leader, Andrew Lumley? As a mystery, The Power House reminded me of The Pelican Brief. Leithen gathers clues through random pieces of information in the course of his lawyering that don't seem particularly important, but eventually lead him to a huge conspiracy. Suddenly people are chasing him all over London and trying to kill him! Improbable? Yes. But, in consideration of the two World Wars England was about to face, a lot of the stuff in the book was creepily prescient. I also liked the fact that the major baddie wasn't German, although his ideas are tied to Germans. The Power House was a good read, although I wouldn't call it unputdownable. It's very short and fast-moving, and once Leithen starts getting into scrapes he takes to danger like a fish to water. Nothing fazes this guy! Not that there are a whole bunch of action scenes; The Power House is more of an intellectual puzzle (Leithen IS really smart) than a spy thriller like The 39 Steps. I think I probably would have prefered it if Leithen started freaking out, but keep calm and all that. I also thought the ending was a bit of a let-down—it seemed like the organization of the Power House collapsed too easily, and everything settled back to normal as if nothing had happened. Which I guess was the goal on Leithen's part, but COME ON DUDE. At least take a vacation or something. So I can see why The 39 Steps is more well-known than The Power House. But I'd still recommend it to fans of spy novels/thrillers or even Edwardian fiction.